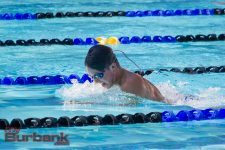 Under favorable weather conditions, the Pacific League swimming finals was held at Burbank High on Thursday and the team standings and individual races went essentially according to form. Two league records fell as Burroughs sophomore Maya Wilson placed first in the 200 yard freestyle after coming in at 1.51.73. The old mark was held by Crescenta Valley’s Heather MacDougal, who swam 1.51.76 in 2013. The other record smashed was by Crescenta Valley freshman Amanda Petersen, who won the 100 breaststroke (1.05.16), breaking MacDougal’s 1.05.23 in 2013. Petersen was a double winner after also taking the 200 individual medley (2.08.45). Wilson placed first in the 500 freestyle (4.59.15) and was part of a foursome that took fourth in the 400 freestyle relay (4.03.62) that included senior Marlena Skrabak, senior Bianca Sanchez and junior Aleah Orozco. Wilson was on the team that garnered fourth in the 200 medley relay (2.06.71) that included senior Annabelle Morning, Skrabak and sophomore Emmanuella Nathan. 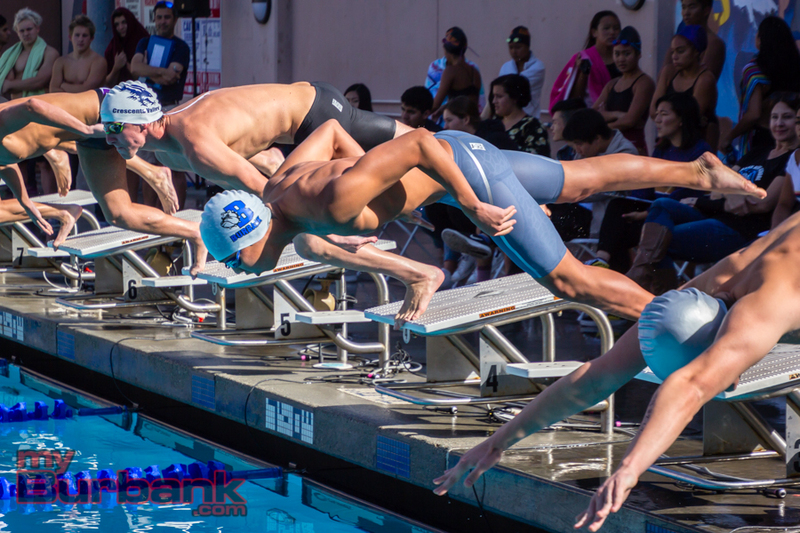 Burbank sophomore David Lee also had a day to remember and was another double winner after taking first place in the 50 freestyle (23.05) and the 100 freestyle (50.17). Lee was a member that included senior Isaac Yang, junior Dorian Andrei and sophomore Ryan Feldman that garnered third place in the 400 freestyle relay (3.28.66) and part of a squad that included freshman Arsen Rostomyan, junior Gevorg Vardanyan and Yang that grabbed fourth place in the 200 freestyle relay (1.36.19). As far as team standings, the Burroughs girls’ varsity placed third with 196 points while Burbank was fifth (173 points). The Burbank boys’ varsity took third (248 points) while Burroughs was sixth (157 points). The Crescenta Valley girls’ varsity took first with 558 points, Arcadia grabbed second (474), Pasadena was fourth (178), Hoover sixth (153) and Glendale nabbed seventh (139). In the boys’ varsity, Crescenta Valley was first (571), Arcadia took second (420.5), Hoover was fourth (165.5), Glendale placed fifth (161) and Pasadena took seventh (110). 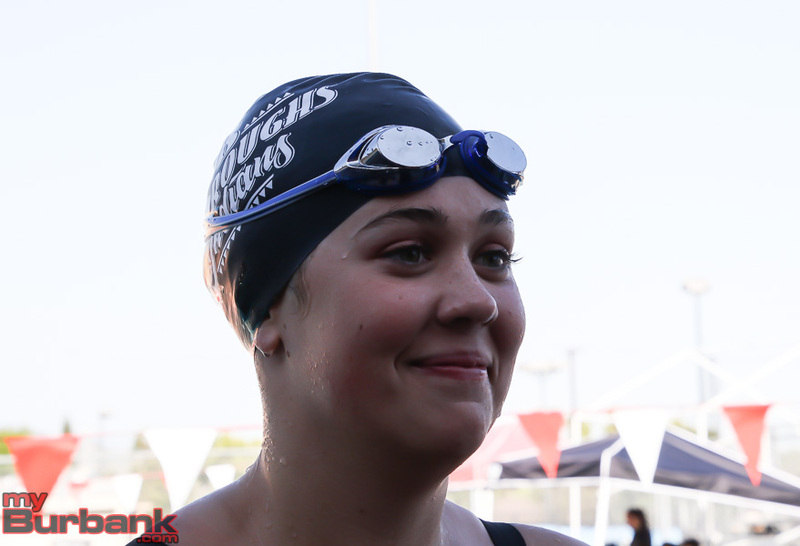 Other strong outings included Burroughs’ junior Reigh Abaoag taking second place in the 100 yard butterfly (52.89) and third in the 100 yard breaststroke (1.01.31). The Burbank foursome of junior Michelle Morlock, sophomore Simone Bethel, junior Emily Udall and senior Angelica Perez took third in the 200 medley relay (2.04.86). Udall also placed third in the 500 freestyle (5.46.97), sixth in the 100 butterfly (1.04.99) and was part of a foursome that included sophomore Simone Bethel, sophomore Geneva Bethel and Morlock that finished sixth in the 400 freestyle relay (4.12.83). In the boys’ 200 medley relay, the team of Rostomyan, Feldman, Andrei and Vardanyan finished third (1.45.87). Other solid placings included the Burroughs team of junior Isaack Dowling, Abaoag, junior Arshak Berberyan and junior Nathan Gault-Crabb that grabbed fifth in the 200 medley relay (1.50.39). 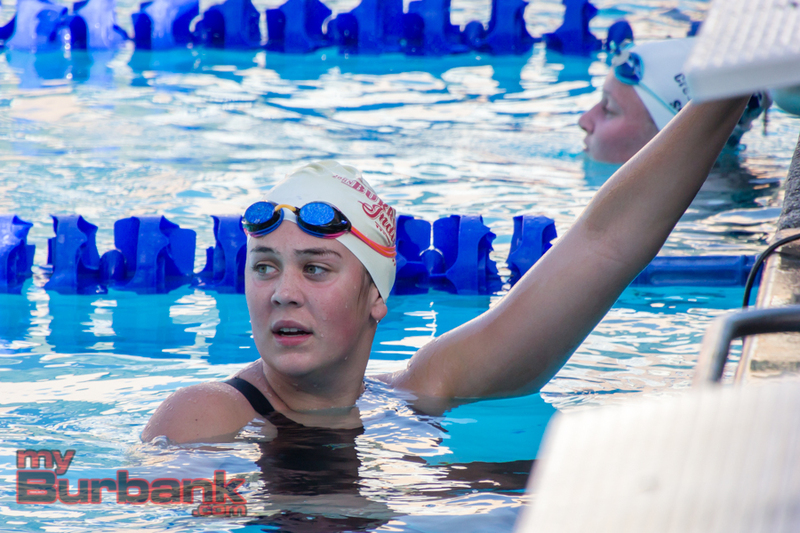 Burroughs freshman Madeline Spangler was seventh in the 200 freestyle (2.15.16) and Burroughs freshman Isabelle Mucha was 10th in the same race (2.19.35). Feldman finished in fourth place in the 200 freestyle (1.49.82) and sixth in the 100 breaststroke (1.05.12). Morlock was fourth in the 100 freestyle (59.02) and ninth in the 50 freestyle (27.05). Gault-Crabb was eighth in the 50 freestyle (24.14), while Andrei was eighth in the 100 butterfly (58.08) and eighth in the 100 freestyle (52.88). 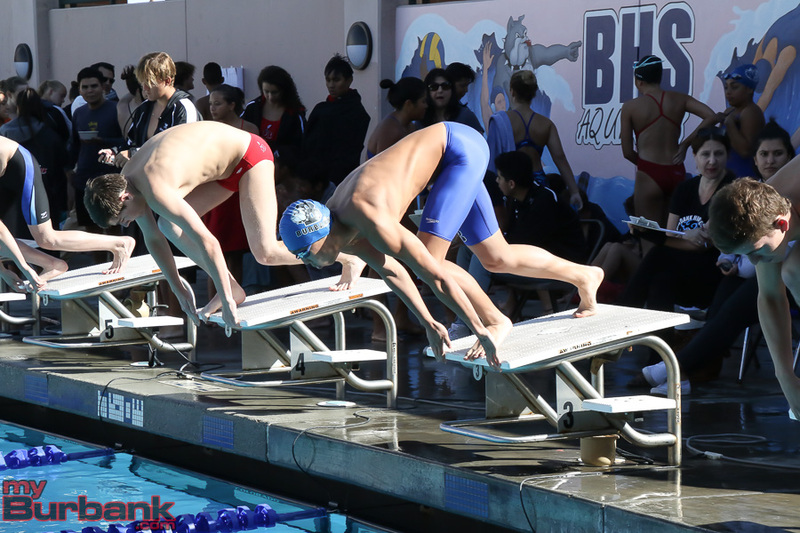 Burroughs freshman Nicolai Lazarev nabbed eighth place in the 500 freestyle (5.34.48). The Burbank team of sophomore Geneva Bethel, Simone Bethel, sophomore Grace Tomasek and sophomore Angelina Chavez finished sixth in the 200 freestyle relay (1.57.59). Dowling, sophomore Arthur Eldridge, senior Scott Sauve and senior Daniel Marinero took seventh place in the 400 freestyle relay (3.46.92). 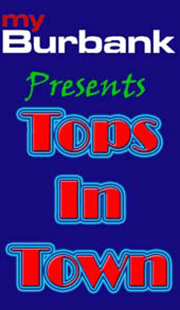 This entry was posted in Sports, Swimming and tagged Aleah Orozco, Angelica Perez, Angelina Chavez, Annabelle Morning, Arsen Rostomyan, Arshak Berberyan, Arthur Eldridge, Bianca Sanchez, Burbank High, Burroughs High, Daniel Marinero, David Lee, Dorian Andrei, Emily Udall, Emmanuella Nathan, Geneva Bethel, Gevorg Vardanyan, Grace Tomasek, Isaac Yang, Isaack Dowling, Isabelle Mucha, Madeline Spangler, Marlena Skrabak, Maya Wilson, Michelle Morlock, Nathan Gault-Crabb, Nicolai Lazarev, Pacific League, Reigh Abaoag, Ryan Feldman, Scott Suave, Simone Bethel, swimming on May 4, 2018 by Rick Assad. 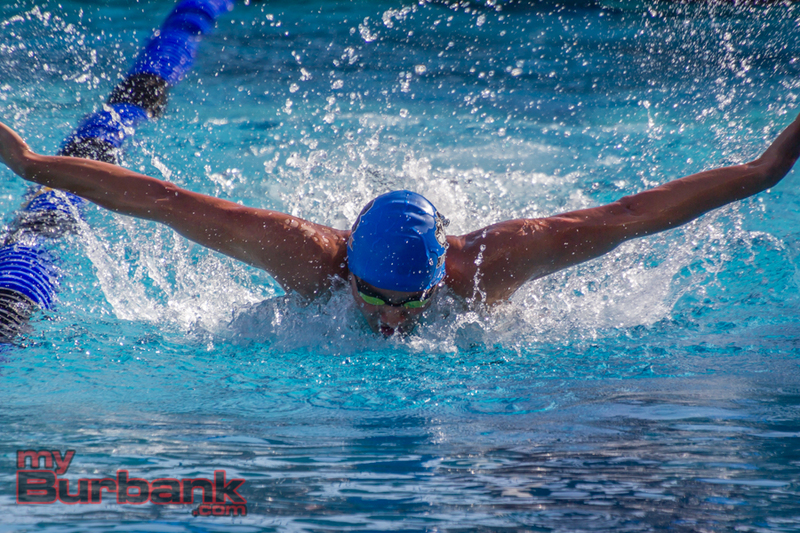 The Burbank High boys’ swim team and the Burroughs High girls’ swim team earned victories Wednesday afternoon when the two rivals squared off in the final dual meet of the Pacific League season at Burbank. Burroughs won the girls’ varsity competition by a score of 86-75. 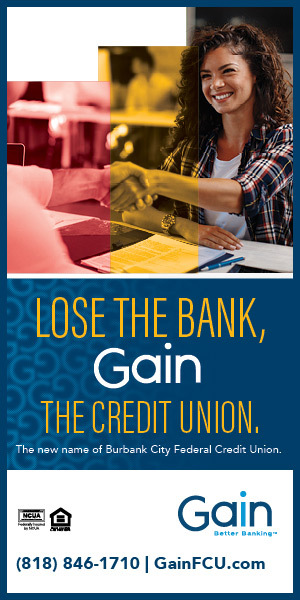 Burbank took the boys’ competition by a score of 85-60. 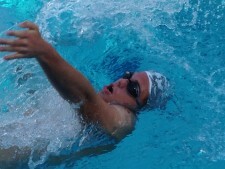 David Lee earned a pair of individual victories for the Burbank boys’ team by winning the 50 and 100 freestyle events. Ryan Feldman was also impressive for the Bulldogs in taking the 200 freestyle and taking second in the 100 breaststroke. 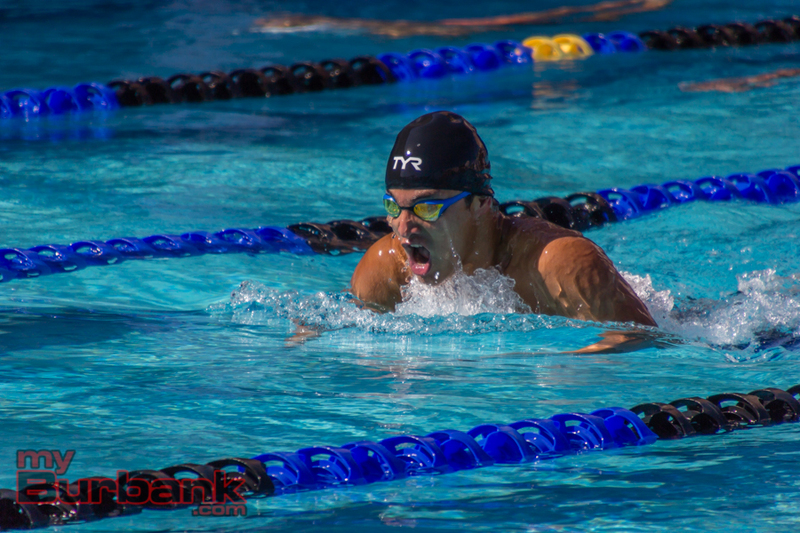 Burroughs boys’ team was led by Reigh Abaoag, who won the 100 butterfly and the 100 breaststroke. Nicolai Lazarev also had some solid performances for the Indians, winning the 500 free and finishing second in the 200 free. Maya Wilson led the Burroughs girls’ team. Traditionally a distance swimmer, she won the 50 free and the 100 butterfly. 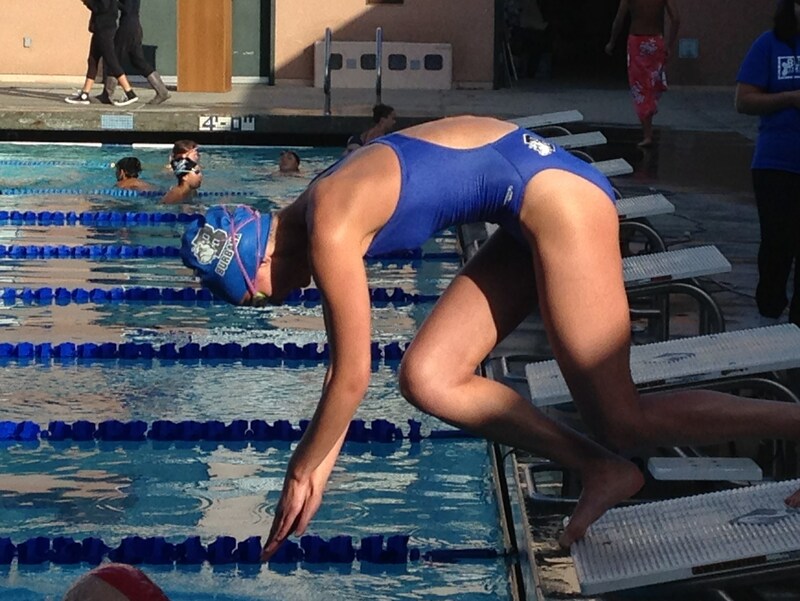 Burbank was led by Michelle Morlock, who won the 100 free and took second in the 50 free. See below for varsity results. 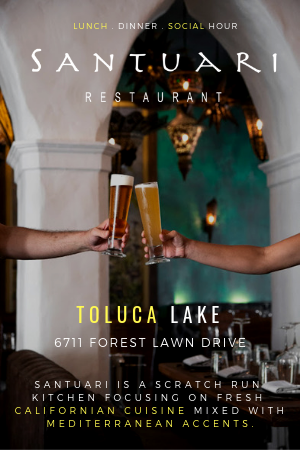 This entry was posted in Sports, Swimming and tagged Burbank swimming, Burroughs swimming, David Lee, Maya Wilson, Michelle Morlock, Nicolai Lazarev, Reigh Abaoag, Ryan Feldman on April 26, 2018 by Jim Riggio. 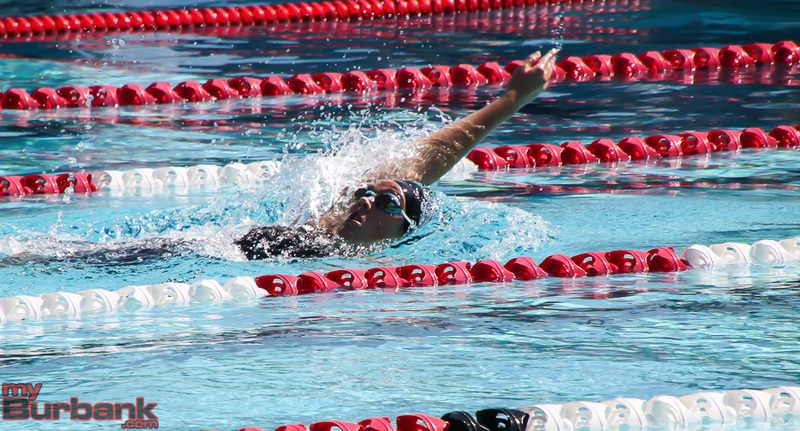 Burroughs High sophomore Maya Wilson isn’t sure what her best swimming event is. One thing she does know is that she enjoys setting school records. 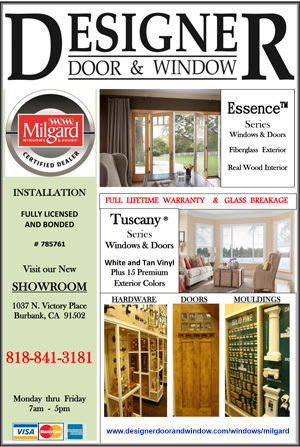 Wilson set another record Thursday as Burroughs defeated host Glendale 101-66. Glendale won the boys’ varsity competition 90-67. Annabelle Morning swims the breaststroke. Wilson set a school record in the 100-yard butterfly, winning in 59.68 seconds. A distance swimmer, Wilson isn’t sure if she wants to focus more on the 200 freestyle or the 500, which is the longest distance swum at the high school level. Wilson also won the 100 freestyle (56.0) and was on the winning 200 medley and 200 free relays. The 200 medley relay team that composed of Wilson, Marlena Skrabak, Annabelle Morning and Aleah Orozco won in 2:08. The 200 free relay team of Wilson, Skrabak, Orozco and Emmanuella Nathan won in 1:56. Nathan won the 500 free (27.94). Maddie Spencer won the 200 free (2:20). Morning captured the 100 breaststroke (1:22). Mia Fallon won the 500 free (6:14). Burroughs also won the 400 free relay (4:22) with Fallon, Orozco, Nathan and Skrabak swimming legs. Reigh Abaoag won two individual events for Burroughs. For the Burroughs boys’ team, junior Reigh Abaoag won a pair of individual events and was on the winning 200 free relay that finished in 1:42. Abaoag won the 100 butterfly (53.07) and the 100 breaststroke (1:04.79). Abaoag recently set the school record in the butterfly. He was joined by Arthur Eldridge, Daniel Marinero and Nathan Gault-Crabb on the relay victory. “We have guys who are really passionate about getting their times down,” Burroughs coach Jacob Cook said. 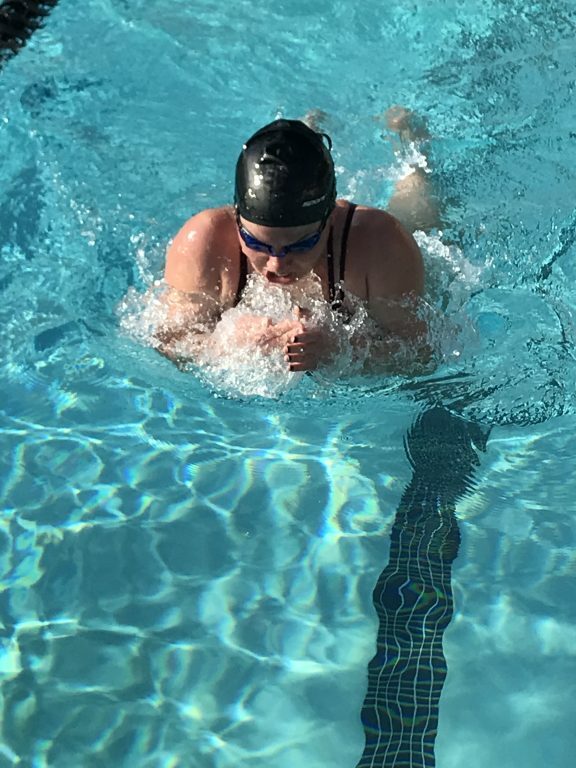 This entry was posted in Sports, Swimming and tagged Aleah Orozco, Annabelle Morning, Arthur Eldridge, Burroughs swimming, Daniel Marinero, Emmanuella Nathan, Maddie Spencer, Marlena Skrabak, Maya Wilson, Mia Fallon, Nathan Gault-Crabb, Reigh Abaoag on April 5, 2018 by Jim Riggio. 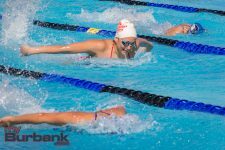 The Burbank and Burroughs High swimming teams are coming off of a solid year and are hoping to maintain that strength into the 2018 season, even though some key swimmers have graduated. Burbank, which set several relay records last season on the boys’ side, will now will led by some distance swimmers. Burroughs will be led by sophomore Maya Wilson, who set a number of school records last year. The Bulldogs lost star Roman Rostamyan to graduation and will be guided by first-year coach Cody Parker. This year the Bulldogs will have junior freestyler Charlie Thorpe and senior freestyler Isaac Yang. Junior Dorian Andrei is solid in the 200 individual medley and is particularly strong in the butterfly. Sophomore David Lee will be counted on to score points in the sprint events. Sophomore Ryan Feldman is also solid in the individual medley and will also swim the backstroke and breaststroke events. For the Burbank girls’ team, junior Emily Udall will be a key performer in the distance events as well as the butterfly. Junior Michelle Morlock is a sprinter, who will also be key on relays. Sophomore Angelina Chavez will also be counted on in the sprint and relay events, as will sophomores Simone and Geneva Bethel. Both Simone and Geneva Bethel swim the freestyle events. The Indians are led by sophomore Maya Wilson, who is a distance swimmer and should return to CIF competition in the 500 freestyle. She will also swim in other freestyle events. The Indians also have returning senior captains Marlena Skrabak, Amabelle Morning and Mia Fallon. Skrabak is a 50 freestyle specialist, Morning is strongest in the breaststroke and Fallon can be counted on to score points in the 200 and 500 freestyles. For the Indians boys’ team, junior Reigh Aboang should lead the way. He is solid in the 100 butterfly and 100 breaststroke. Junior Issack Dowling is another key swimmer who is a backstroke specialist. Junior captain Nathan Gault-Crabb will be able to help the Indians out in a number of areas. This entry was posted in Sports, Swimming and tagged Amabelle Morning, Angelina Chavez, Burbank High swimming, Burbank swimming, Burroughs High Swimming, Burroughs swimming, Charlie Thorpe, David Lee, Dorian Andrei, Emily Udall, Geneva Bethel, Isaac Yang, Issack Dowling, Marlena Skrabak, Maya Wilson, Mia Fallon, Michelle Morlock, Nathan Gault-Crabb, Reigh Abaoag, Ryan Feldman, Simone Bethel on March 6, 2018 by Jim Riggio. Burbank High didn’t have specific plans to break the school’s record in the boys’ 400 yard freestyle relay. But the Bulldogs have done just that on a number of occasions. 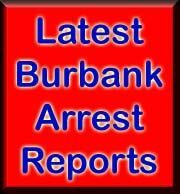 They did so once again Tuesday when the Bulldogs defeated Burroughs 90-79. Burroughs won the girls’ competition 99-70. 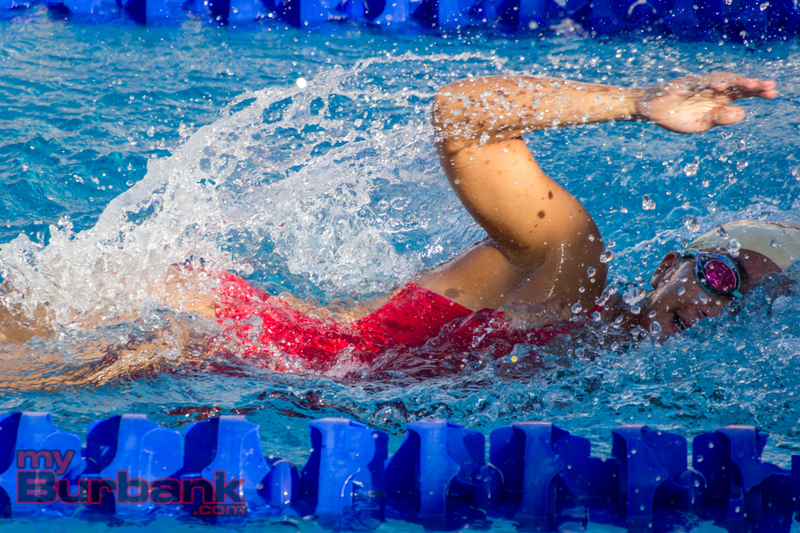 The Burbank team of Rostomyan, Aki Arlington, Ashot Gvurmadzhyan and Justin Miller swam 3 minutes, 27.96 seconds. Rostomyan, who has received a CIF consideration time in the 100 butterfly, won the 200 freestyle (1:53.07) and the 100 backstroke (59.57). Arlington won the 50 freestyle (23.26) and Miller the 100 free (51.38). Reigh Abaoag led Burroughs with wins in the 100 butterfly (55.24) and the 100 breaststroke (1:03.56). Cameron Suave won the 500 free (5:26.19). On the girls’ side, Burroughs got a pair of wins from Mikayla Gardner in the 100 butterfly (1:03.92) and the 100 backstroke (1:04.52). Kyra Helfrich won the 100 freestyle (57.09) and Lizzy Wrobel the 200 freestyle (2:14.22). 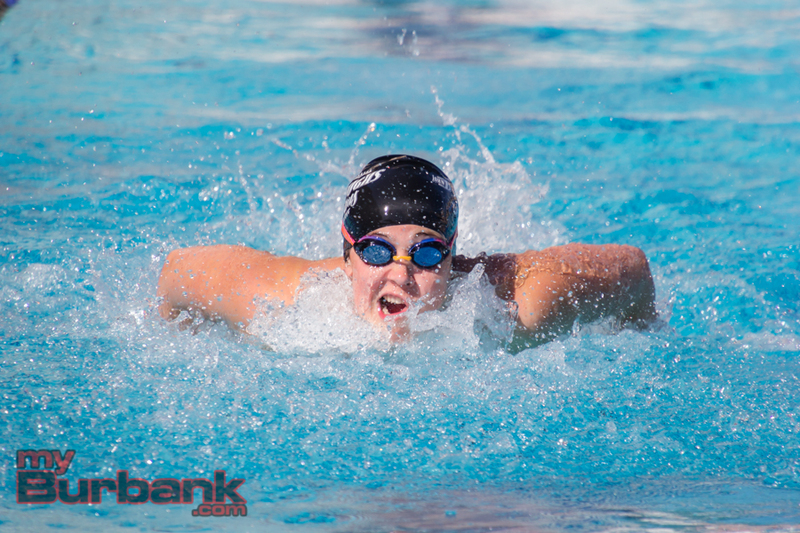 For Burbank, Melissa Udall won the 200 individual medley (2:31.26). Michelle Morlock won the 50 freestyle (27.97) and Ashley Hinterlong the 100 breaststroke (1:16.28). 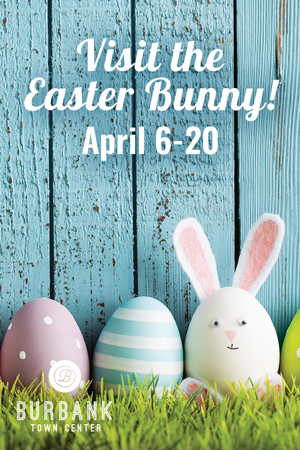 This entry was posted in Sports, Swimming and tagged aki arlington, Ashley Hinterlong, Kyra Helfrich, mikayla gardner, Reigh Abaoag, roman rostomyan on April 26, 2016 by Jim Riggio.